In 2005, writer Sari Botton and her husband, a musician, were casualties of hyper-gentrification. After a long, legal battle, they were evicted from their large, bohemian apartment on Avenue B in New York City, and moved to the Hudson Valley, eventually settling in Kingston. Their old place was renovated, designated a landmark building, and rented to a famous film director for four times what Botton paid. Upstate, Botton began to collect other women’s stories about leaving New York, including long-time Kingston resident Valerie Eagle and TMI Project Executive Editor Eva Tenuto, eventually editing (and contributing a piece to) the bestselling essay anthology Goodbye to All That: Writers on Loving & Leaving NY. 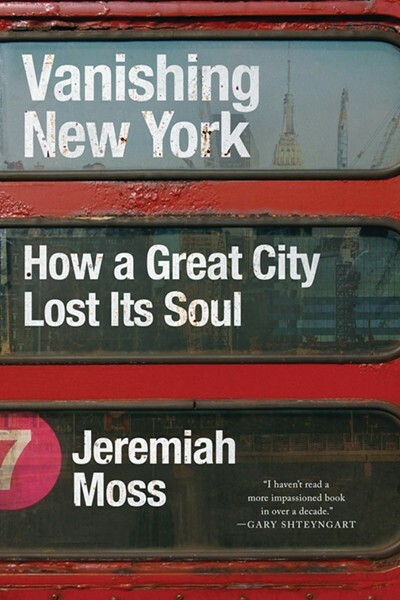 Since 2007, “Jeremiah Moss” — the pseudonymous writer behind the popular Vanishing New York blog and author of Vanishing New York: How a Great City Lost its Soul – began chronicling the shuttering of New York City’s beloved establishments due to quickly rising rents. Hyper-gentrification, a term he coined, is just what it sounds like: rapid, unsustainable growth that edges low-to-middle income communities out of cities through unaffordable living expense increases. Moss believes the culprit is a shift toward neo-liberalization in city government, where developers and corporations are prioritized to the detriment of citizens and small business owners. An activist, he’s even staged protests in support of businesses who were about to lose their leases. On Friday, August 18th, Botton and Moss will be in conversation at Kingston’s City Hall to do just that. Botton wants to discuss zoning which includes affordable housing, imposing a vacancy tax, and the role artists play in gentrification, and to hear Moss's ideas for Kingston and other cities like it. The conversation is well-timed, as many Hudson Valley towns are being squeezed by gentrification. “We need to play a different part if we want a different outcome,” Botton explains. Vanishing New York Blogger/Author Jeremiah Moss Joins Local Writer Sari Botton for a Conversation About Hyper-Gentrification at City Hall’s Council Chambers, 420 Broadway in Kingston: Friday, August 18th; 6-8pm; free. Learn more on Facebook or email kingstonwritersstudio@gmail.com. A conversation between Moss and Botton was recently published on Longreads.com, where Botton is Essays Editor. Read an excerpt of Moss’s book, which The Golden Notebook will have for sale at Friday's event in Kingston.